Photo: From Confrontier by Kai Wiedenhöfer published by Steidl. On January 25th, 2017, President Donald J Trump signed Executive Order 13767 mandating the construction of a physical wall to be built on the southern border between the US and Mexico. Trump also called for the wall to be directly funded by the Mexican government, resulting in a planned meeting between Mexican President Peña Nieto (previously scheduled for the 31st of January) to be cancelled, instead, the two presidents exchanged an hour-long phone conversation (prolonged by constant translation) in which Nieto was apparently “humiliated” by Mr Trump¹ ². Relationships have ultimately remained frosty between the two nations and diplomatic ties have not yet improved. 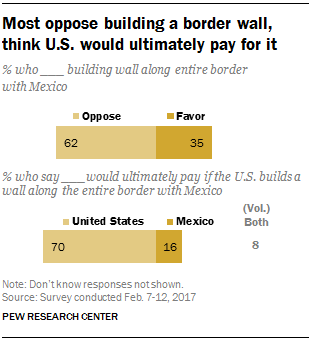 The push for greater security on the southern border is currently a highly controversial topic; according to Pew, 35% of the population is in favour of a wall while 62% oppose such an endeavour. The survey, conducted from February 7th-12th, 2017, asked 1503 adults from across the country to voice their opinions regarding this issue. Demographic groups such as those from a white background and those ages 50+ were more likely to be in favour of a border wall when compared to similar demographics, however; demographic groups such as those from an African American background and those from the ages of 18-29 were more likely to oppose the construction of a border wall when compared to similar demographics. While the construction of a wall is highly unpopular, immigration reform is not; according to a separate study conducted by Pew in the year prior, 77% of those interviewed said that establishing stricter policies to stop people from overstaying their visas was an important or somewhat important policy, while only 21% said it was not important or not too important. Similar figures were also uncovered regarding the topic of preventing illegal immigrants from receiving government benefits (73% important/somewhat important, 25% not at all important/not too important). The threat of public backlash is not the only problem Trump has in his effort to “secure the border”; geography, money, and resources will all prove to be a particularly difficult adversary. Only around 30% of the US-Mexico Border is fenced or walled according to the US Border and Protections Agency in 2009, however; fence expansion continued in 2010 and onwards. To this day, a very large portion of the United States border with Mexico remains physically open, with only around 700 miles of the border covered with some form of fencing, as opposed to the 1989 miles of total border length. Around half of the nearly 2000 mile border is marked out by the Rio Grande, one of the principle rivers in the south-western United States and northern Mexico; the Boundary Treaty of 1970 requires that all construction near the river, on either side of the border, must not interfere with the river’s flow. The same 1970 treaty also applies to the location of where the Colorado River crosses the border between the two countries. Due to the shape of both rivers, any border wall must cross over the river. Existing fences around these locales lie far from the river, in some places almost a mile away from the water. If Trump was to build his wall in these areas, he would have to adhere to (or manoeuvre around) not only the 1970 treaty maintained by the IBWC (International Boundary and Water Commission) but also other regulations regarding where and how general structures are built in areas such as these. Border walls have already been constructed in adherence to these guidelines but in vastly different situations, most notably the “Floating Fence” that lies on parts of the desertified border in California. Another issue that is likely to prove a problem for the incumbent president lies in the form of the two bodies of water that lie on either side of the land border. Both the Pacific Ocean and the Gulf of Mexico present a huge task if one was to attempt to secure the US-Mexico border. The 1000 mile wall is, according to the White House, expected to cost in the region of $8 billion to $12 billion, while Congressional Republicans expect it to cost from $12 billion to $15 billion, however; a study by the MIT Technology Review concluded that the cost of the wall could range from $27 billion to $40 billion, significantly more than any other estimates. Even if the Trump administration is able to afford the wall itself (materials, labour, etc) there is still a large possibility that the team would be unable to acquire the privately-held land that would be required in order to construct the wall. Presidents George W. Bush and Barack Obama both attempted to purchase private land on the Texas border in the aim of border security. An effort from Obama to acquire land in the Rio Grande Valley in court has now carried over to the Trump administration. The wall’s funding still requires congressional approval, and there is an uncertainty regarding how much money they would give to indulge such an undertaking; there is also the possibility that Congress would not approve of funding at all, thereby eliminating all chances of the wall being built. With this in mind, it could be many months, if not years, until we see any real progress towards construction and/or an alternative solution. I had no idea about the treaty. This is huge mess. I am for stronger immigration laws and vetting, but the idea of a completed wall would be near impossible for any president to do.